I finally got around to visiting one of Ireland's most famous Castles. Leap Castle was probably built around the late 15th/ early 16th century by the O'Bannon Clan who were subject to the ruling O'Carrolls. The Earl of Kildare, Gerald FitzGerald, tried to take the castle on several occasions during the early part of the 16th century. The tower house is three storeys high with a crenellated wall-walk. 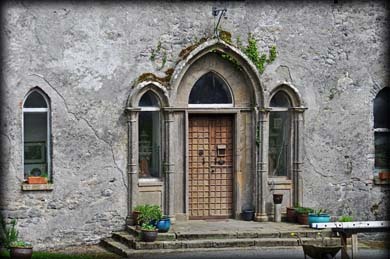 The west face, pictured above, has a 16th century doorway inserted. The original doorway was in the south wall and the original machicolation above the doorway is still present. 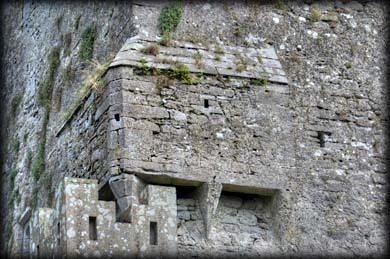 There is a rectangular bartizan on the northwest angle of the tower, that can be entered from the chapel on the top floor. The castle is most famous for it's appearance on several paranormal TV programmes, including Most Haunted and Scariest places on Earth. 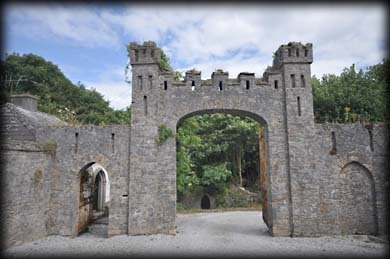 There are many ghost stories associated with the castle, one during the turbulent occupancy by the O'Carrolls. A member of the family, a priest was saying mass in the chapel on the top floor when his brother burst into the room and thrust a sword into the priest killing him. This story may be responsible for the room being known as 'The Bloody Chapel'. A small hidden chamber was found in the floor of the bloody chapel in 1920. 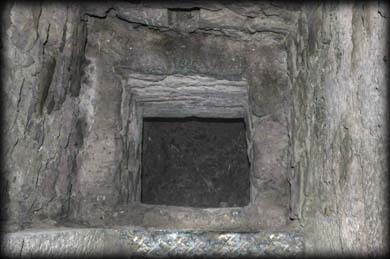 This opening in the floor is known as a oubliette, unsuspecting guests or prisoners were pushed into the opening , which had large wooden spikes in the floor of the chamber. They were left to die impaled on the spikes below. Three cartloads of bones were removed from the oubliette. Another spirit said to reside at the castle is a supernatural entity known as the elemental, usually accompanied by the nauseous smell of a decomposing body. 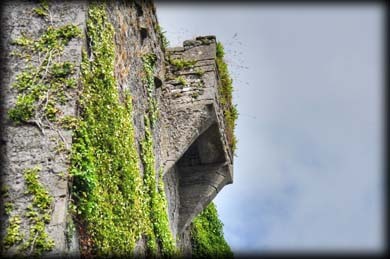 These stories led to Leap being known as Ireland's most haunted castle. In about 1660 the castle passed into the hands of the Darby family. The tower house was vastly altered during the 17th century when a Jacobean house was attached to the northern face. A later Georgian house was built around the Jacobean structure. Leap was burnt out and destroyed in 1922 by the IRA when the Darbys were living in England. In the early nineteen hundreds the occult was fashionable and Mildred Darby begun dabbling in the black arts in Leap. She is credited with unleashing the Elemental spirit to the castle. 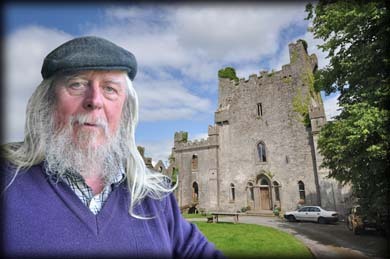 The present owner is Sean Ryan, a retired traditional musician, who bought the castle in 1991 and offers tours of the castle. Sean is a most gracious host. 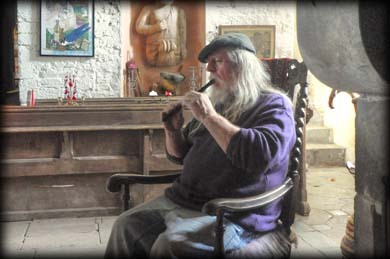 We had a wonderful time exploring all the rooms in the castle and Sean entertained us with a history of the castle and it's surroundings along with a few ghost stories and a tune on the tin whistle. All this while sitting around a roaring open fire. Situated: From the Round Tower in Roscrea head north on the N62. Then take the first left, then right onto the R421 for Kinnitty. Follow the road for about 10 Kilometres. Leap Castle is on your right. Discovery Map 54: S 1284 9750. Last visit Aug 2014.